Young Gun: Chef/owner Michael Toscano stands at his restaurant’s entrance; by age 21, he’d worked his way to the position of sous chef of Mario Batali’s Babbo. 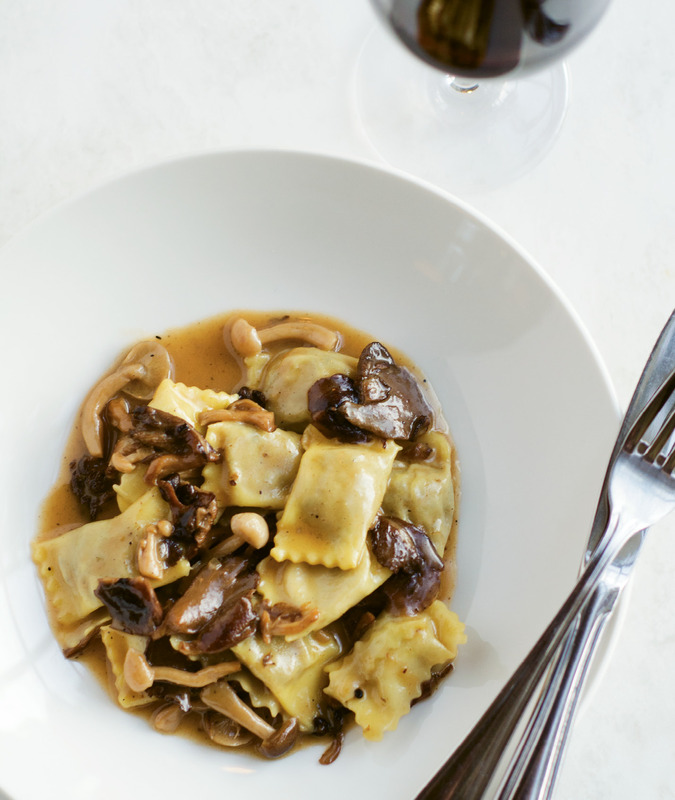 Pasta Pillows: Duck and Parmigiano-filled agnolotti with oyster and shiitake mushrooms. 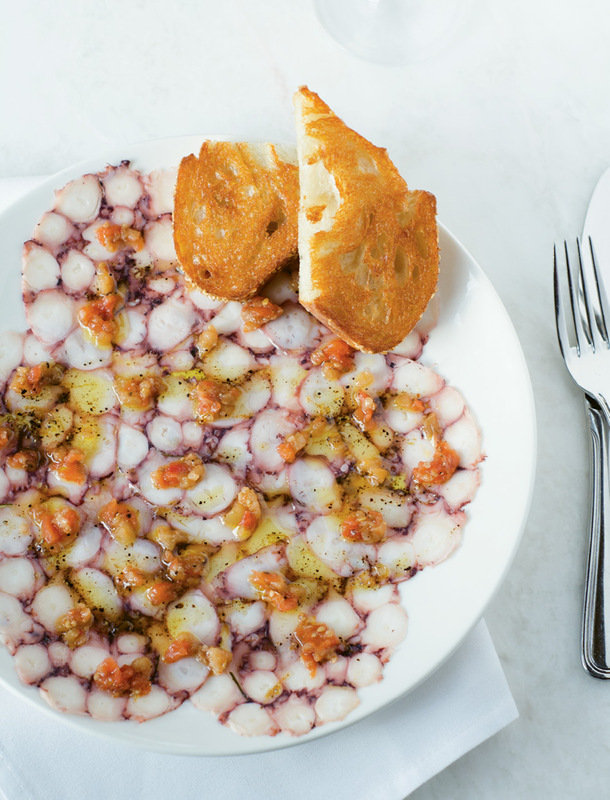 A work of art: The thinly sliced octopus carpaccio with drizzles of pickled eggplant and roasted tomatoes makes a scrumptious starter. 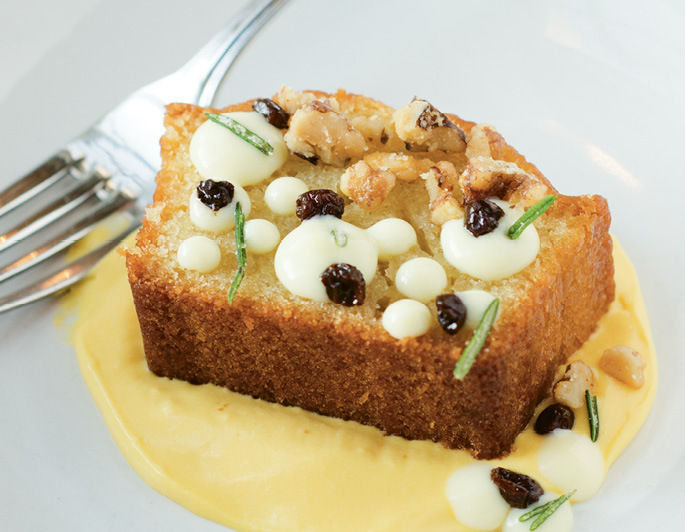 Light & Bright: Toscano’s olive oil cake blends the best of savory, salty, and sweet with garnishes of pickled currants, candied rosemary, and olive-oil pudding. 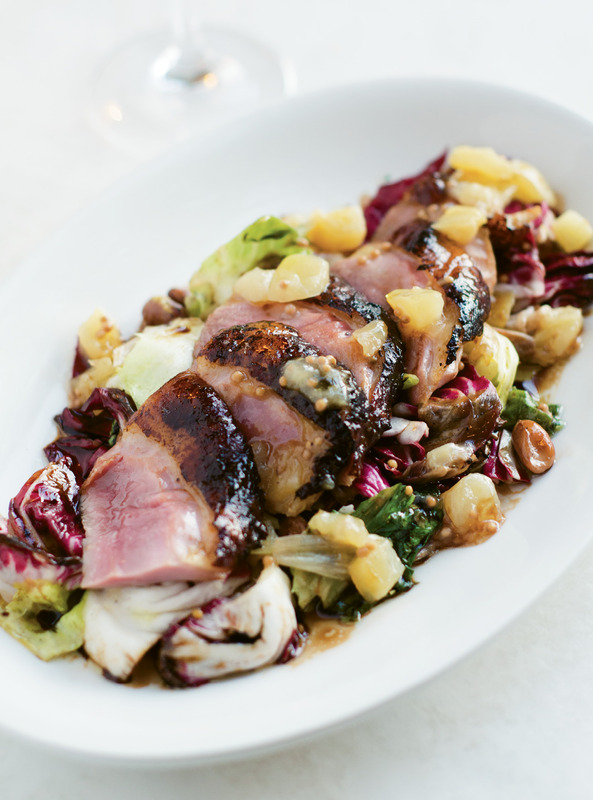 In Luck with Duck: Slices of tender roasted duck breast with grilled radicchio and escarole and a spicy apple mostarda. “Le farfalle!” retorts an Italian elder with a sigh and faint toss of the hand. Taken literally, the expression translates to “chasing butterflies,” and, indeed, the word farfalle flutters off the tongue like a true onomatopoeia. But symbolically, “le farfalle” is an Italian idiom for the romantic pursuit of farfetched dreams (if you’ve ever tried to catch a butterfly, you understand). Executive chef Michael Toscano is one to dream big. And if his dreams are farfetched or unrealistic, well, he sure fooled us, achieving most everything he has ever set out to accomplish. Case in point: working his way from dishwasher to cook as a teenager in his native Houston, Texas; winning a scholarship for the American Culinary Federation apprenticeship program in Pinehurst, North Carolina, where he doubled up classes in order to graduate early; and pounding kitchen doors in New York to land jobs working for culinary legends Thomas Keller and Mario Batali. By the age of 30, with impressive gigs in the kitchens of restaurants Babbo, Manzo, Perla (of which he was an owner), Jeffrey’s Grocery, and Montmartre already under his belt, Toscano had garnered more accolades than most chefs hope to tally in a lifetime of very hard work. 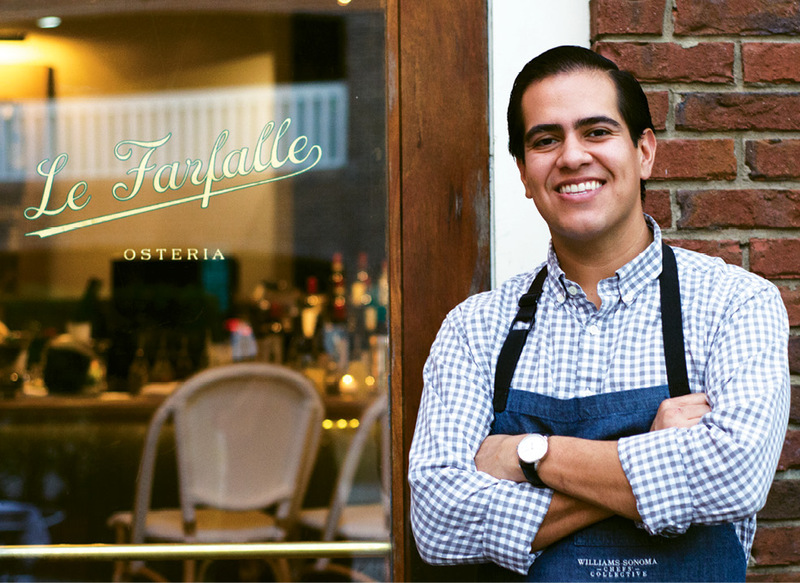 Then abruptly, in 2015, Toscano uprooted his young family (including his wife, Caitlin, whose front-of-house résumé rivals Michael’s kitchen kudos), closed the chapter on his immensely successful New York career, and moved South to open a proposed osteria in a then-yet-unknown location somewhere in the heart of Charleston. Soon enough, the space at 15 Beaufain Street became available, and the couple leapt at the opportunity to renovate the centrally located property. Most of us still associate this building with the former Vickery’s Downtown, whose dark walls and beer-stained floors played host to boozy brunches and late-night shenanigans. Successor restaurant Leaf disposed of Vickery’s mountain of empty mini-bottles and opened statuesque doorways onto the tree-shaded patio. Le Farfalle ratcheted up the design anew with bright, contemporary touches, neutral colors, smoky mirrors to echo the already sizeable interior, and elegant booths for privacy. Handsome wine racks replaced Leaf’s flatscreen TVs. The space has matured, right along with those of us who once enjoyed it (in our butterfly-chasing youth) as Vickery’s. As one would expect from a James Beard “Rising Star Chef” semi-finalist (2014), Toscano keeps it interesting. You may go one week and fall in love with a chicken piccata dish cooked in the round, meaning that teardrop breasts and deboned thigh meat are rolled up torchon-style and wrapped like a Tootsie Roll before being slow-poached to juicy perfection, flash-fried to order, sliced into crispy yet moist discs, and served with lush mashed potatoes. Order the same dish on a subsequent visit, and the chicken will have undergone an entirely different regime of brining, curing, and roasting before lounging atop a bed of greens alongside a confited leg. In short, don’t get too attached to any one preparation. You may taste dreamlike agnolotti, hand-pinched pockets stuffed with creamy roast chicken and dressed with a light sauce “al sugo di arrosto” (flavored with the meat’s own drippings), then return to find the little pasta pillows now filled with duck and Parmigiano and tousled with oyster mushrooms and woodsy shiitakes grown by Benedictine monks a short drive up Highway 52. In many cases, the varied dishes are a result of the ingredients themselves. For example, each week Le Farfalle makes use of an entire pig, with no cut ever the same. An Instagram search of local heirloom-breed pig supplier Holy City Hogs will inform you that the delicious fennel sausage in your Bolognese ragu, or the soffrito-inflected aromatic meatballs, came from an 11-month-old Tamworth fattened up beneath live oaks on Wadmalaw. A giant wheel of aged Parmigiano-Reggiano forms a commanding centerpiece each evening in the dining room, so patrons can snack on salty nibbles while sipping wine. Non-alcoholic shrubs are deliciously balanced with seasonal scuppernongs, fresh herbs, or fiery ginger underpinnings, pairing well with an oval of seriously addictive, rosemary-sprinkled warm focaccia, served with whipped ricotta so airy and satisfying that one doesn’t even need the extra dippings of roasted tomato sauce or top-shelf olive oil. If pasta prices seem a little steep, particularly at lunchtime when a modest bowl might knock you back about $20, rest assured that all of Le Farfalle’s pasta is made in-house, is hand-cut rather than machine-extruded, and often uses unusual grains like buckwheat or sorghum (that is, the nutty seed from the sorghum stalk, not to be confused with sticky-sweet molasses). The budget-conscious can opt for great happy-hour specials or shareable small plates such as Umbrian stewed chickpeas spiked with preserved lemon and slathered on a baguette, or the beautifully plated paper-thin octopus carpaccio, a delicate marvel served with hearty, crunchy garlic-rubbed toast points. The Drawback: Meals can be on the expensive side, but you pay for quality, craft, and restraint.